With conformal space we are concerned with angles rather than distances. We therefore don't need a complete metric which tells us what the distance between any points are, we only need to define enough to allow angles to be defined. For example, imagine that we have a space with a set of lines meeting at certain angles and we change the scale, multiplying all distances by 'n', the distances may change but the angles at which the lines meet remain the same. As another example of a conformal transformation, think about the exponent as a function of a complex variable, this distorts lines into circles but lines that met at 90° before the transformation (red and green lines below) still meet at 90° after. At an infinitesimal level all angles are preserved. 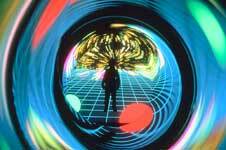 Conformal space turns out to be a null space, that is all distances square to zero. In other types of space (such as Euclidean space) we might define a metric like √(Δx² + Δy² + Δz²) which defines the distance between any two points but in conformal space squaring a distance always gives zero so this would always give zero distance between any two points. We can embed other spaces, such as Euclidean or Minkowski space, into conformal space by adding two extra dimensions to them (in a certain way that we will discuss later). Moving such spaces into conformal space can help us simplify certain problems, as might be expected in a world where angles are important, it is easier to work with rotations. Sometimes, when modeling how solid objects move in space, we want to define a transform which can represent both rotations and transformations. This is possible in conformal space because translations can be represented as rotations with an infinite radius. Infinities can be dealt with because conformal space allows for compacification. The two extra dimensions that we add when we embed another space into conformal space are often thought of as representing the points at infinity and the points at the origin. We can combine quantities to give 'meet' and 'join'. The space is linear (we no longer need to use a shear transform). We can now use Clifford Algebra. We can now represent circles, angles etc. as quantities in our geometry. We now have to embed our space in a space with two (instead of one for projective space) additional dimensions, so an 'n' dimensional space is embedded in a 'n+2' dimensional conformal space. Because the additional dimensions square to zero then the infinite series exp(x) = 1 + x1/1! + x2/2! + x3/3! ... + xr/(r)!/1! now becomes exp(x) = 1 + x so exp(iθ) = 1 + iθ. 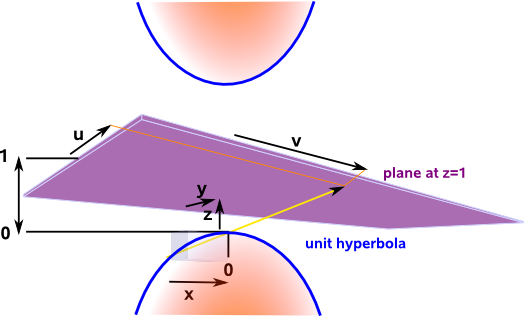 If rotations in Euclidean space obey spherical geometry (constant positive curvature) then the two additional dimensions obey hyperbolic geometry (constant negative curvature). By combining them in a suitable way then we can get flat space to represent transforms. We can think of the two additional dimensions as representing infinity and zero, that is, the infinitesimally small and the infinitely large. We can think of translations as being rotations with a centre at infinity. Before we delve into the theory, here is a summary of some of the useful results, so that we know where we are heading. 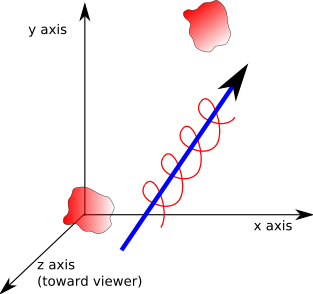 Reflections are represented by vectors and isometries (rotation and translation) by even grades (scalar and bivector). †t is the conjugate of t.
The result is of the same type as 'e' but transformed as required. The rules for multiplying out the different basis for vectors, bivectors etc. (n1,n12 , n∞1 ...) are shown on this page (in a table at the bottom) with derivations. The outer product '^' represents the 'join' of two elements, that is the two elements and a set of points in between. Then we can combine them as follows. The inner product '•' represents the 'meet' of two elements, that is the intersection of the two elements. 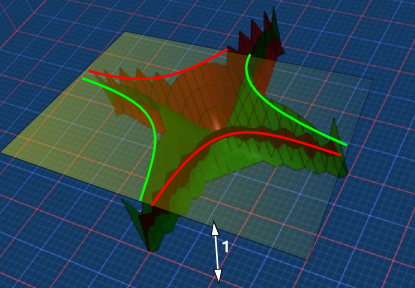 When we looked at projective (hemisphere and stereographic model) space we saw that it had useful properties especially for modeling and rendering 3D solid bodies using computers. However it is not practical to use clifford algebra to model projective space, if we want to do that then we need to use vectors which square to zero, to do that we need to add another dimension which squares to negative. This means that we now have two additional dimensions, added on to our euclidean space, one which squares to positive and another which squares to negative. The constraint that we use null vectors allows us to model isometries (such as 3D solid bodies) the simplest way to do this is set the scalar value of n0 to the constant value -1. However there are advantages to compactifying the space, using the stereographic model, so that we can represent the point at infinity. This allows us to represent lines, planes, etc. 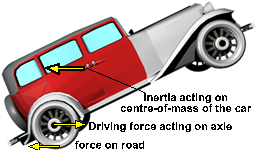 as a single multivector and allows to have different transforms like reflecting in a sphere. n0, n∞, n1 and n2 are basis vectors described below. a, b, c and d are scalar values. We can multiply the conformal vector by a scalar factor without affecting the point that it represents. This gives us the flexibility to use our null vectors in different ways. If we set the n0 dimension to a constant value of -1 then we can represent the projective model, this is the simplest to calculate isometries , most of the examples on these pages use this model. However we can multiply by the factor 1/(1+u²+v²), this compactifys the space using the stereographic model, so that we can represent the point at infinity. This allows us to represent lines, planes, etc. as a single multivector and allows to have different transforms like reflecting in a sphere. 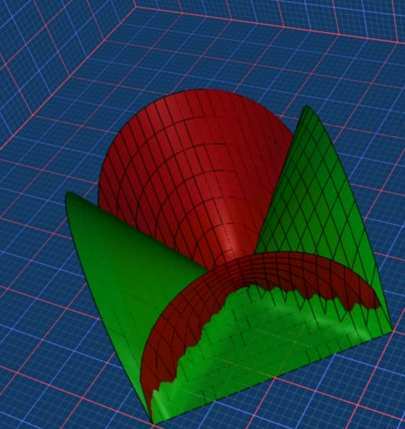 We saw that the stereographic model was conformal (preserved angles) so we will start with that and add our additional dimension to it. note: we use z-1 instead of z because the point we have chosen the origin as the point we are projecting from rather than the centre of the circle. Since w squares to negative then that is equivalent to x² + y² + z² - w² = 0 if w squared to +ve. 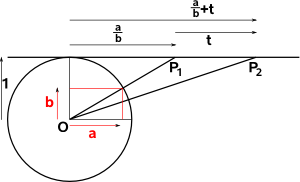 Can we derive the translation between conformal and euclidean spaces by projecting using a straight line in the same way that we did for projective space. Let us take the example of 2D euclidean space (4D conformal space). The extra dimensions are z and w where z squares to positive and w squares to negative, that is z is real and w is imaginary. This table has some unusual features, the n0∞ term does not square to a scalar term. We can see that individual products are neither commutative nor anti-commutative as we can see when we reflect the terms in the leading diagonal. However the multiplication is reasonably well behaved in that it is associative. So far we have been working in 4D which is very difficult to visulaise so for now we will drop down to 1D Euclidean space which gives 3D conformal space, this may not be very useful, but it will allow us to establish the principles in a way that we can visualize. 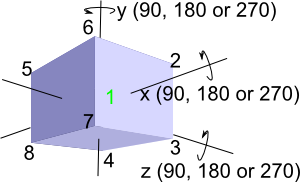 Here the base (x and z dimensions) represents the two additional dimensions and the height represents another dimension in the conformal space. 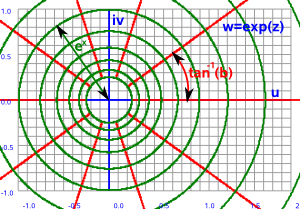 The green surface on the above plot represents all the points which are zero distance from the origin, that is null vectors. However this is not the usual measure of 'distance' here we are using the Minkowski metric (see Minkowski space), that is one dimension which squares to +ve and the other squares to -ve, we have also rotated these two additional dimensions by 45° so that the null at the base vectors point along the axies. In the projective case we represented the vector where it intersected the line at y=1, in the conformal case we will represent it where the above surface intersects the plane at z=1. Note: in this plot we have changed our usual conventions and plotted z as the up-down axis. points are represented by null vectors, zero distance from the origin, using Minkowski metric. we have one degree of freedom and all the points on our one dimensional Euclidean space map to the points on the line in the diagram above. So what are p & q? This is equivalent (isomorphic to) to Dual Complex Numbers. We can embed euclidean space into a higher dimensional space, called conformal space, this makes transform operations involving rotations and translations easier to work with. 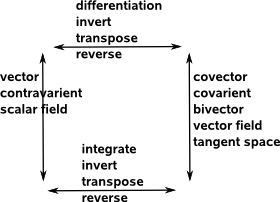 It allows us to represent all angle preserving transformations. When we discussed euclidean space we said that there is no specific origin (unless we add an arbitrary coordinate system) and any point is as good as any other for zero point. Euclidean space also does not have a way to represent points at infinity. Conformal space adds two new dimensions, one represents zero and the other represents infinity. I haven't yet got an intuitive understanding of why we need whole dimensions to represent these points. We can now represent translations as rotations around an axis at infinity. (Its interesting to speculate if there might be a duality here to allow us to represent translations as rotations at zero?). It is possible to represent operations, in this space, using different types of algebra, for example matrices, the most common type of algebra which we use to represent this geometry is Geometric Algebra. This is a very good match, the particular GA we use has 4 dimensions which square to +ve and one which squares to -ve, known as G4,1,0. e∞ = the dimension at infinity. The way that we use this algebra to represent translations and rotations is described on this page. using GA to represent translations and rotations. This page follows on from the page about projective space. You will also need to know something about Minkowski space.We also use notation from Clifford Algebra. Roger Penrose - Cycles of Time. This book uses conformal space to discuss black holes and the big bang. And relate that to specific cases. If we change the definition of 'distance' slightly we create a space with different properties. In Euclidian space the distance from the origin is given by √(x²+y²+z²) but in Minkowski space we change the definition of distance to √(x²+y²+z²-t²). This gives lots of interesting properties which we look at on this page. 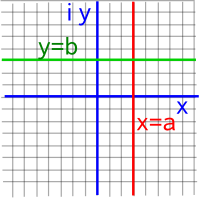 The algebra generated depends on the vector it is based on, not only how many dimensions it has, but also whether these dimensions square to positive, negative or zero scalars. This page explains this and also defines other subalgebras. 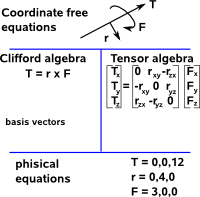 In physics we have equations like T= r × F which apply independently of the origin and direction of the coordinate system that we are using. 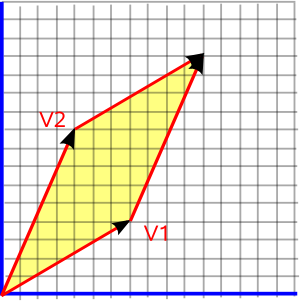 If we have two vectors then they define a plane (assuming the vectors are different from each other). This page explains how this is an extension of the idea of a cross product. The square of a positive number is positive. The square of a negative number is positive. And the square root of a negative number does not have a solution. However we can define different algebras where the square root of a negative number does exist. For example, complex numers, these algebras use 'i' which is the imaginary operator representing the square root of minus one.